The Roundtable depends upon its members for suggestions as to future programs, including talks by members as well as invited speakers. If you want to make a presentation, contact Bob Schuldenfrei (e-mail: bob@s-i-inc.com), Steve Seftenberg (seftenberg1020@gmail.com), or me (honeybell7@aol.com). We are in for a real treat: Monroe Ackerman, one of the earliest members of the Roundtable and a superb speaker, will introduce us to "The first 40 days of Abraham Lincoln’s Presidency." Robert Krasner started his talk by saying that it wasn’t until Memorial Day 1977 that the first "Confederate Medal of Honor" (designed in 1968 and cast in 1977) by the Sons of Confederate Veterans ("SCV") was awarded at Smyrna, Tennessee to Pvt. Sam Davis, "The Boy Hero of the Confederacy," for service in Coleman's Scouts at Pulaski, Tennessee. On November 27, 1863, Davis, then 21 years old, was captured with documents detailing Union military plans. Because he refused to identify his informants, he was executed. Eventually only 51 medals were awarded by the SCV, the last one in 2013 to Maj. James Breathed for his bravery as an artillery officer in the 1864 Battle of Spotsylvania Courthouse in Virginia. Krasner then asked, "Why did it take 115 years to honor bravery in defense of ‘The Lost Cause’?" For the answer, we must go back to 1862. Wanting to improve morale at home and at the front, on October 10, 1862, the Confederate Congress passed and President Davis signed an act authorizing medals and badges of distinction to be awarded for courage and good conduct on the field of battle. Political infighting over the design of the medal and who would get the contract to make it, as well as shortages of metal and military reversals, meant that the war ended with no medal ever designed, made or awarded. There was, however, a Confederate Roll of Honor which recognized a small portion of these Confederate soldiers and their deeds. General Order No. 131, dated October 3, 1863, explained its purpose: "Difficulties in procuring the medals and badges of distinction having delayed their presentation . . . to the officers, non-commissioned officers, and privates of the armies [and later, of the navy] of the Confederate States conspicuous for courage and good conduct on the field of battle, to avoid postponing the grateful recognition of their valor . . . it is ordered" that the names of all those reported as worthy, be inscribed on a Roll of Honor, to be preserved in the office of the Adjutant and Inspector General for reference in all future time, read at the head of every regiment at the first dress-parade after its receipt and published in at least one newspaper in each State. Uniquely, the men (and one woman) to be honored were to be selected by their fellow soldiers. During the war, in excess of 2,000 names were placed on various Roles of Honor. Military defeat and occupation, Reconstruction, displacement of people and a depressed economy meant that it took about 40 years before any real effort was made to honor the memory and valor of Confederate soldiers. Between 1900 and 1913, the Daughters of the Confederacy issued 78,761 "Southern Crosses of Honor" (see picture of Southern Cross below). "To you, Sons of Confederate Veterans, we commit the vindication of the cause for which we fought. To your strength will be given the defense of the Confederate soldier's good name, the guardianship of his history, the emulation of his virtues, the perpetuation of those principles which he loved and which you love also, and those ideals which made him glorious and which you also cherish. Remember, it is your duty to see that the true history of the South is preserved to future generations." 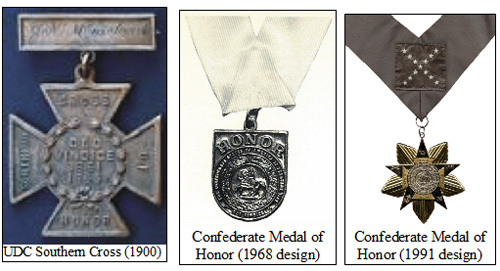 However, nothing was done about recreating a Confederate Medal of Honor until August 16, 1968, when the SCV passed a resolution at its annual convention to reestablish the medal. To avoid controversy, there had to be certified proof that each recipient performed "above and beyond the call of duty, at the peril of one’s life" (Requirements similar to those for the United States Medal of Honor after 1917). "Attacked by four enemy gunboats, Lieutenant Dowling ordered his 42 men to hold their fire until the gunboats reached a premeasured range. At his command and in spite of the hot and furious assault upon their position, Lieutenant Dowling’s men answered with an incredibly accurate fire. After 45 minutes of action in which 137 projectiles were fired from six guns, two of which were soon put out of action, Lieutenant Dowling’s command inflicted more than 400 casualties and compelled the surrender of the USS Clifton and Sachem, together with 350 prisoners, while themselves sustaining no serious injuries. By his intrepid leadership and defense at Sabine Pass, Lieutenant Dowling thwarted an amphibious invasion of Texas by 5,000 infantry on an armada of twenty-two transports and four gun ships." "Captured with five others in a skirmish outside Front Royal, Private Overby and his companions, instead of receiving the humane treatment accorded prisoners of war, were ordered to be executed. Reviled and beaten by his captors, Private Overby could only watch as three of his fellow prisoners were wrenched away, dragged through the streets and summarily shot. Private Overby nevertheless remained erect and defiant. Despite a noose around his neck, he refused to give his executioners vital information that could compromise his battalion, even in exchange for his life; instead, with his last words, issued a dark prophecy of revenge." "During the desperate struggle for he salient, with much of the fighting hand-to-hand, and with the fate of the army hanging in the balance, Private Hancock voluntarily left the cover of the traverses and braved a terrific storm of musketry--perhaps some of the most intense of the war–to bring badly needed ammunition to his exhausted comrades in arms. Although detailed as a courier to the brigade commander, he repeatedly risked his life to cross the bullet-swept terrain in the all day fight in the rain, promptly returning each time with more cartridges for the men in the works with little concern for his own safety. Private Hancock’s unselfish action despite witnessing the death or wounding of so many others in the same attempt, was valor of the highest order, and marked him for special notice from the brigadier general commanding." With only twenty-nine men, Captain Mosby stealthily entered the enemy’s line undetected and under cover of the night and made his way to the headquarters of the commanding general. After ordering telegraph lines cut and all horses, arms and ammunition seized, Captain Mosby entered a private residence and captured the brigadier general commanding. With his raid complete, his captured stores and prisoners guarded and all his men accounted for, Captain Mosby, now more than ten miles behind enemy lines, led his men south and then abruptly west to confuse pursuers. Again employing stealth and brazen audacity, Captain Mosby guided his column into the night past numerous enemy lines. As a result of his daring raid, Captain Mosby captured one brigadier general, two captains, thirty other prisoners, fifty-eight horses and numerous arms and equipment, all without firing a shot. In this singular action that so typified his movements throughout the war, Captain Mosby instilled a fearsome respect among his foes while engendering a lasting admiration from his comrades in arms."